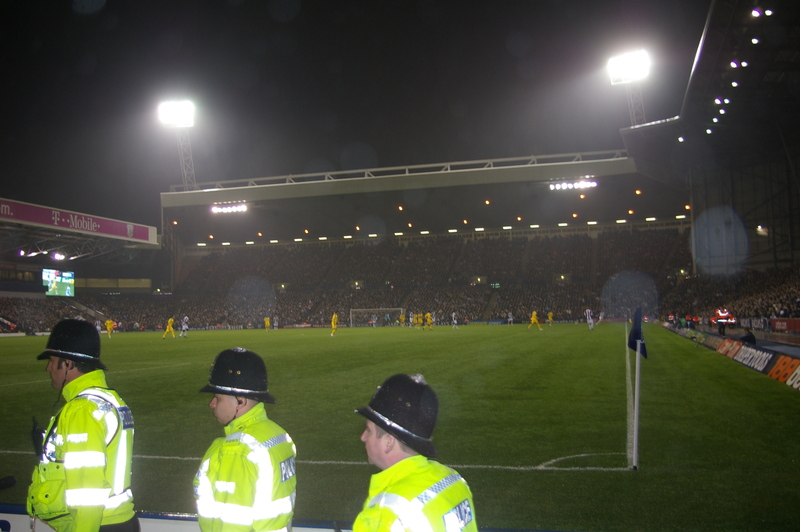 West Bromwich Albion vs. Chelsea : 15 November 2008. Just another day in paradise – or the heart of the West Midlands, to be precise. A late kick-off was good for me, as it meant I had no rush to get up. I was even able to pop into town to run a few errands. Saturdays are usually completely devoted to Chelsea, which can cause problems! Glenn kindly volunteered to drive the 110 miles up to Birmingham – this gave me free reign to relax and have a few beers. Frome stalwarts Dave and Paul were also travelling with us. We left my village at 10.45am. Five of the boys were heading up from Marylebone in London and we had arranged to meet at a pub near Snow Hill station. Our route again took us through Bristol. On the elevated section of the M32, to our left, there is an IKEA warehouse. This was built in around 1996 on the site of Eastville, the former home of Bristol Rovers. Seems that every Chelsea fan of a certain age from the West Country was at the 3-0 loss we suffered at the hands of Rovers in February 1980. An infamous game – it ultimately cost us promotion and was memorable for the police horses trying to control the fans…the horses were even on the terrace at the Tote End at one stage. I remember watching from the North Stand seats, looking around and seeing Glenn and his grandfather a few rows behind us. 28 years ago – oh boy. It was an easy trip up. Glenn is a bit of a speed merchant. Talk was of Glenn’s new job. He thought he had it tough with the banter from the non-Chelsea supporting lads at his old factory, but the youngsters at the care home he works at are much much worse! As chat quietened, Keane were on the CD player. At 12.30pm we parked up at a hotel just off the M6. We had a quick pint at the Park Inn bar, then quickly walked past The Hawthorns to catch a metro train into the centre of Brum. By 12.45pm, we had exited the train and were sat in “Edmunds” bar – formerly The Corner House. I have hardly ever been out drinking in Brum city centre before. We ordered some beers ( Becks Vier to start, but I then spotted some Staropramen…nice.) After about twenty minutes, the London Boys ( Alan, Daryl, Gary, Simon and Milo ) arrived. Milo ( aged 10 ) and Gary ( aged 11, sorry 43 ) had been playing Chelsea Top Trumps on the train up. Food and more beers were ordered. I had brought up the photos from Rome – all 150 of them – and these were handed around, with comments from myself. The texts to and from America began! I heard that about 30 Chelsea were meeting up in Stamford, CT, for a game at a bar…a nice thought…them on their road trip, us on ours. As usual, the banter was great – the beer was flowing and it was all good. I commented that – for one game only – The Bada Bing were The Bada Boing. I had a text from Connecticut that The Goons had lost. Superb. At about 4.30pm, we retraced our steps to Snow Hill and caught the train to The Hawthorns. It was only a seven minute trip. A few Chelsea were onboard. A few songs. There was steady rain as we queued to get into the away end. The nine of us were spit into two groups. Alan, Gary and myself were right down the front by the corner flag, second row. Lovejoy was in the front row. But really disappointing seats – we are all away season ticket holders and we usually get allocated the prime seats. Not on this occasion. We mumbled a few grumbles of complaint. The other six lads were way back in LL. We had a good 3,000 turnout and we had all been drinking by the sounds of it! Another wet Chelsea game – at least we were undercover, not like in times of yore. I like the Hawthorns – a good, compact ground now that the corners are all connected. It always was a good ground – the new stands have retained its character I feel. We settled ourselves down for the game. Chelsea in all yellow – maybe they took my advice from Blackburn. The entire Chelsea contingent stood the whole game. No bickering stewards asked us to sit, thank heavens… but I was involved in a war of attrition the whole game with stewards who kept asking me not to take photos. I do have a big old lens and was asking for trouble…but with the flash off, I managed to take about 15 shots. I texted a few people to tell them to keep a look out for me on TV. I thought West Brom began well and caused us a few problems. We seemed to take an age to get into our normal rhythm…however, once we scored, we looked good – for eleven minutes! What a finish from Bosingwa – one of the best players on the day. And what lovely finishes from Anelka too…being so low down, our perspective on the action at the far end was really poor…on seeing the replays on TV, I realised how cool he had finished. A great ball from Kalou on the third goal. Behind me, in the concourse, at half-time, it was going mad. About 300 Chelsea were doing the “Bouncy Bouncy” ( a Rangers song, adapted by us – having a pop at Tottenham ) and then the “Juliano Belletti” song. It was crazy. I felt old! To be honest, we were expecting a hatful more goals in the second-half and were a bit dismayed that no more goals ensued. And despite the beer being topped-up at half-time, and the 300 being in good voice at the break, the noise levels weren’t that great in the second period. If anything the home fans – next to us in The Smethwick End ( louder than the Birmingham End ) – were outdoing us. I quite like West Brom as a club, but fear they might not stay up this season. Bumped into Mark Coden on the way out. A wet walk back to the car…I bought a hot dog and onions ( which I later regretted! ) to sustain me…the rain was still falling, the cars were leaving the ground in fits and starts, the streetlights reflecting on the roadside puddles…a typical scene…the home fans silent, the away fans an extra bounce in our step. Listened to BBC’s “606” and a call from a West Brom fan really annoyed me. He hadn’t been to the game, was relying on the local radio coverage, but still felt so aggrieved that he had to phone “606 to vent his feelings. We all agreed that West Brom had played alright – they had been a bit unlucky. Why did that bloke have to moan and complain? Go and support the team next time, mate! We reached home at 10pm…it had been a very quiet trip back really. I think we were a little deflated that we hadn’t scored a few more goals…football fans – we’re never happy are we?